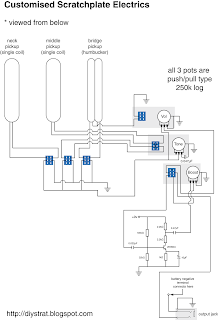 OK, here are the schematics for the electrics (click for bigger image). It is viewed from below. Remember that this is based around two single coils and a humbucker and that all three pots incorporate push/pull switches. The three toggle switches allow you to use any or all of the pickups at the same time, and even switch them all off, so it has a sort of muting function too. The booster is based on a Vox Treble Booster and the battery negative wire is connected to the middle ring of the output jack so that it only ever completes the circuit when the lead is plugged in (to be able to do this, the jack socket must be stereo, giving you that extra middle ring, although the actual output signal will, of course, be mono). That way you don't need to worry about storing your guitar and leaving the booster turned on. Also note that this means the battery is ALWAYS being used when the lead is plugged in, even when the booster is not switched on. The reason for this is that otherwise you would hear a loud popping noise when you switched the booster on. To be honest, I'm assuming you understand a certain amount about making small circuits if you are thinking of copying this circuit. You should be able to print this out in good quality (300dpi) on an A4 page. I decided to try some fancy stuff with the electrics. I’ve always enjoyed messing about with electronics, so was a lot more confident with this part than I had been with the woodworking. 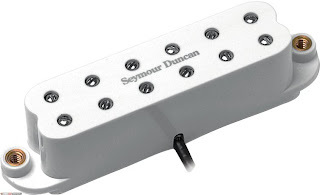 Two tone controls (note, these are not treble and bass, but rather a tone control for the neck/mid-position pickups and another for the bridge-position pickup). 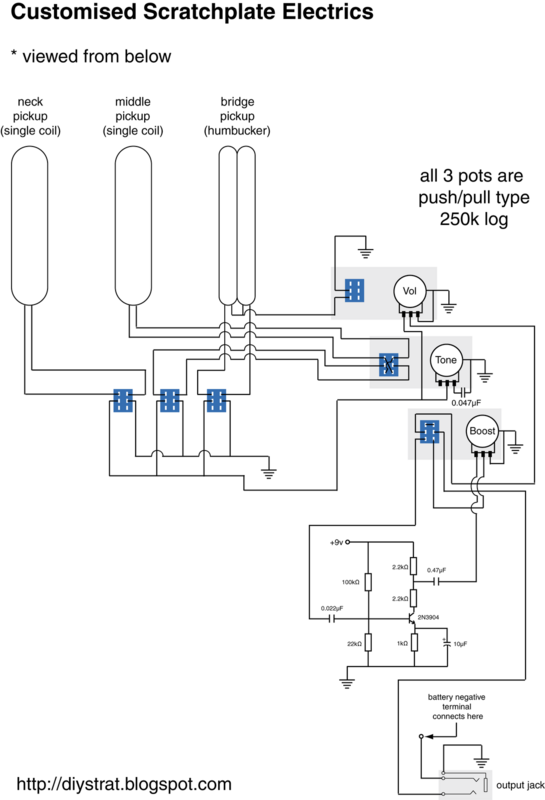 The boost circuit would be based on a Vox Treble Booster and would be built by yours truly (me). 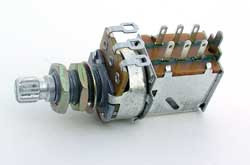 It will take several entries to describe all of the electronics in detail, so I’ll start by explaining some of the parts that I needed to source. 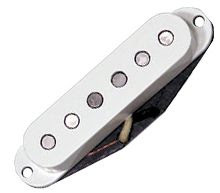 For the bridge pickup, I wanted to get one of these babies. I really wanted to keep the bridge position looking single-coil-like, but have a bit of “oomph”. This is a Seymour Duncan Lil’ ‘59 Jr. 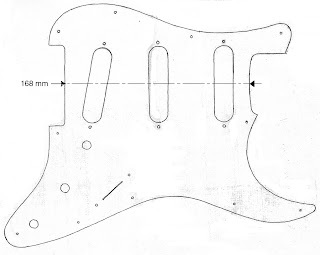 It would have been really easy (and pretty cheap) to just buy a standard Stratocaster scratchplate (pickguard), but I wanted to make my own. You could buy a blank rectangle of scratchplate material at your guitar shop (or mail order one from somewhere like http://www.stewmac.com), but I went for the absolute cheapest option and used a piece of plastic I found in the street one night. 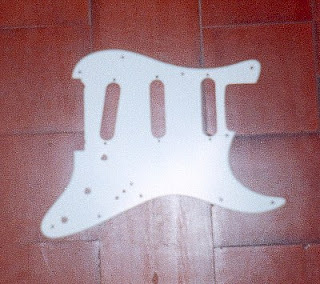 I used the same technique as I did with the body of the guitar, which was to tape the plan onto the plastic, then cut around it. Again, I would recommend that you do this a different way. Print it onto card, then draw an outline around this onto the piece of plastic itself. Anyway, the cutting was pretty easy compared to the wood. A hacksaw for a rough outline, followed by filing and sandpaper. 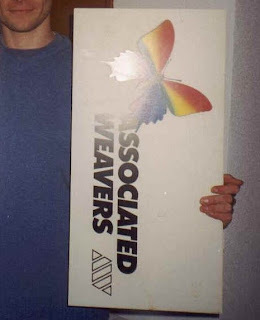 Oh yeah, and the sign was cleaned up by sanding the "Associated Weavers" decal off. 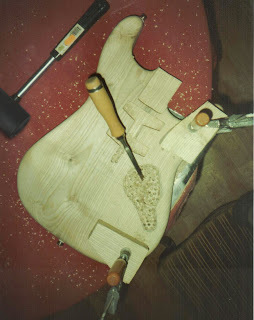 The small screw holes were drilled (and finished off with a tapered countersunk drill bit), and the pickup holes were drilled out and filed, then sanded into shape. One more thing. Instead of cutting out a slot for the five-position pickup selector switch, I decided to make three small holes for toggle switches (one for each pickup). This would later allow me to choose any possible pickup combination, which would not normally be possible (more on the customised electrics later). This was the bit I had been most worried about. 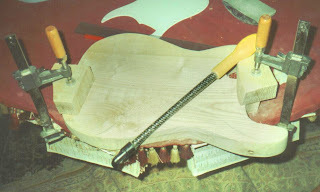 The neck joint. You see, if you get this bit wrong, even by a couple of mm, then the guitar will be unplayable. Of course you can always fix mistakes, but it's much better to do it right in the first place. So here was the challenge. I had hardly any tools and had to rout out the joint. I could do it the same way as the rest of the routing, but that would leave me with a pretty uneven surface. It really had to be dead on. So I did it in two stages. First I did the same as the rest of the routing, then I finished it off with a small straight routing bit attached to the drill. 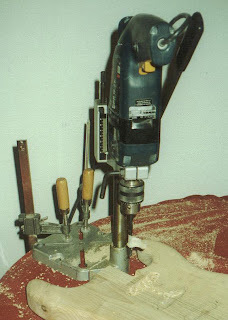 The drill was attached to a drill stand (or drill press), and I set the limiter so that it would stop at just the right height for the surface of the neck joint. There was a bit of a problem though. I only have two hands. The drill stand's lever was spring loaded, so I had to keep one hand on that, leaving just one to somehow move the guitar around. In the end I had to hold the lever down with my right hand, then use my right elbow and my left hand to move the guitar in and out. The guitar was resting on a shiny magazine so that it could be moved around with little effort. I realise this technique sounds totally ridiculous, but given the tools I had, it was the best I could do. And in fact the end result was completely acceptable. So far I had made a rough cut of the guitar body shape, then finished it off and sculpted a little bit with the round rasp. After that, a bit of sanding and I was done with the basic body shape. 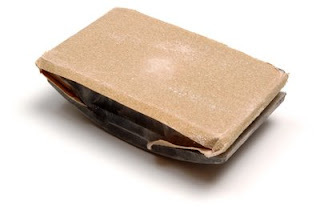 For sanding, make sure you use a sanding block on the front and back faces of the guitar. You really have to keep these bits nice and flat. 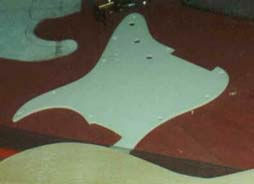 Then use your hands for the curved parts that the sanding block just can't reach. 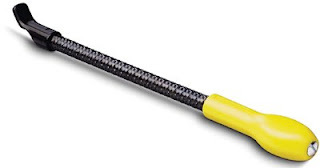 By all means use the block for curved bits that you can reach. Be prepared for a few blisters on your hands! You will also see the hammer and chisel in the photo. That's because after drilling is done, you can use a hammer and chisel to take out the rest of the wood. It's a long, slow process, but gives good results if you're patient. You can also see in the photo that the neck joint has been routed out, but I used a slightly different technique for this, since it had to be very accurate. I'll explain in more detail next time, so stay tuned. After cutting out a rough outline with the jigsaw, I tried various tools. I wanted to find one that would be able to remove a decent amount of wood if necessary, but also leave a smooth-ish finish. I tried various grades of sandpaper, a plane, chisels and a flat rasp (practise on a scrap piece of wood!) None of them were really suitable. Then I got my hands on one of these!